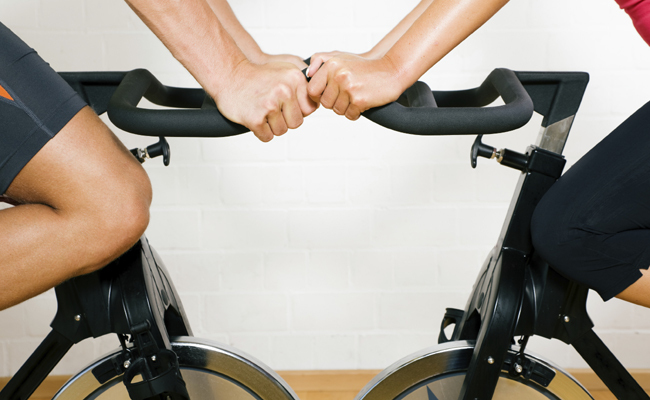 One of the most popular ways to get in shape, exercise bikes are perfect for both home and commercial use. Exercise bikes offer a low impact way to strengthen your cardiovascular system, and make excellent fitness machines for all types of users, including complete beginners. One reason that they are so popular, is their ease of use – all models have different levels of resistance, so you can work your legs, heart and lungs as much or as little as you want. Cycling is also popular with athletes of all types as a way of staying in shape off-season, or rehabilitating injuries without putting any load on the joints. For those with low back problems, recumbent exercise bikes allow them to work out while resting their low back, making recumbents a great choice if you have back problems. As with any bike, the primary muscle groups worked are the leg and glute muscles, but as these are the biggest muscles in the body, when you work these lower body muscles you can burn plenty of calories. In many cases it is the simple things that make a big difference. The most important thing is that the bike is the right size for you, allowing you so pedal in safety and comfort. That means that adjustable seats and handlebars are a must, in order to ensure that you fit the bike properly. In addition, a properly shaped and cushioned seat will allow you to ride in comfort. The biggest change in these machines over the past few years has been in the programs and feedback they provide. While the original models simply had a speedo, modern bikes have sophisticated electronic monitors that will show your speed, average speed, distance covered, heart rate, etc. In addition, a good quality machine will also offer a wide variety of pre-defined work out programs such as hill and flat workouts, intervals and so on, to enable you to pick and choose the type of workout you do. The choices of different workout programs enables you to choose the type of training you want to do, and means that you won’t get bored. There's a number of additional technical things you need to consider. We've bullet pointed these below. The main options are: Magnetic: With magnetic resistance, you can increase resistance smoothly and easily and pedal quietly. Air resistance works based on a fan built into the wheel – the faster you pedal, the greater the air flow and resistance. In addition, the air from the fan can help cool you down. Resistance is provided by something slowing the fly wheel, and is manually adjusted using dials. With flywheel bikes, the resistance is regulated by the heavy flywheel, and maintained by the energy you build up with your pedaling. Whichever type of exercise bike you choose, you should rest assured that you are buying one of the most effective and popular cardio machines on the market. As always, the more you spend, to a certain extent, guarantees you more longevity, more features and probably a good warranty too!